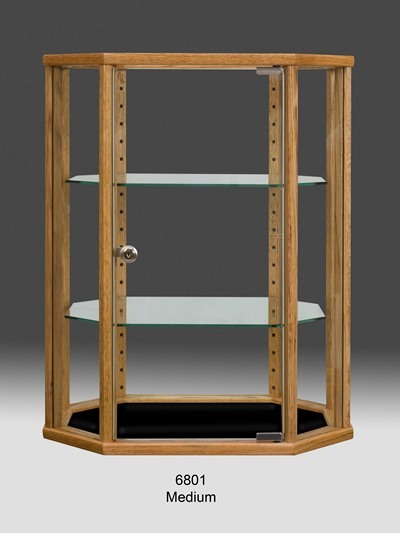 This is a wooden octagon countertop display cabinet. The countertop design of this display case allows you to place it conveniently for the customer and it saves space. This display case has two adjustable shelves for easy customization. These shelves are tempered glass to increase their stability and durability. There is also a locking door that keeps unauthorized personnel from accessing your products. The solid construction of this countertop display case is due to a solid wood construction. For added visibility one 50watt halogen light comes standard with this display case. This keeps products consistently visible at all times. We also build custom wooden countertop display cases if this design does not fit your requirements exactly. Click here to view the full line of custom finishes we have available for this wooden octagon countertop disp.